Expect better performance at a distance'if you can lead 'em right. This year's shotshell theme was better shot density at long range. Browning's BXD delivered tighter patterns and shorter shot strings, Black Cloud Flex proved deadly on ducks and geese at the edge of the decoys and now Hevi-Shot has dropped Hevi-X, a tungsten load that they have billed as offering "35 percent more knockdown power at 40 yards and 50 percent more knockdown power at 60 yards." I received a couple boxes of both BBs and 2s to test. The velocity on the box says 1,450 fps. I ran a string of 10 shots over an Oehler 35P chronograph on a 70-degree day, and found the average velocity to be 1,463 fps, just a tiny bit higher than advertised. My invitation to hunt ducks in Uruguay was lost in the mail, so I didn't have the chance to give Hevi-X a try on the real thing, but from that data and on the patterning range, it stacks up pretty well. 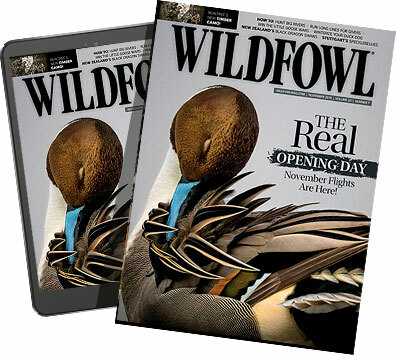 Also, WF editors heard some good feedback on the new load from early-season honker shoots in the Dakotas. And editor Skip Knowles hit a public duck hole near home and was impressed how the 12-gauge 4s clobbered a mallard at 52 yards and a screaming wood duck at 35, the only two shots he's fired with it (RR T3 chokes). I dissected a shell and weighed the components. The plastic hull contained 32.9 grains of a black flake-style propellant, and the wad was of conventional heavy-plastic cup construction with four equidistant slits. The No. 2-size shot charge carried a counted 114 pellets weighing 523.3 grains (1.23 ounces) topped off with 17.5 grains (.04 ounce) of buckwheat, which is a lightweight spacer to properly fill the hull for crimping. Some of the pellets were misshapen, with an occasional snowman (two pellets stuck together), but didn't appear to affect the performance. At the range I shot a series of 40-yard patterns, with two different style chokes using No. 2 Hevi-X. First I ran the Patternmaster's Anaconda Long Range, then the Anaconda Mid Range. These use a spiral gas-bleeding ring with constrictions of .700 and .715 respectively. They call it a "Coil Zone" that both relieves the pressure and spins the wad with a negative twist to stabilize it in flight. The other tube was Jeb's High Voltage in .690 and .695 constrictions. I selected this tube because it uses the traditional conical-parallel-style of choking. It funnels the shot charge to the specific constriction, then stabilizes the charge as it flows through the parallel portion of the tube. In each case, the more open choke yielded some percentage points to the tighter-constricted tube. The patterns were then evaluated using a 30" Plexiglas disc with a 20" center ring. Hevi-Shot was not ready to reveal Hevi-X pellet density, but I ran the data through a KPY Shotshell Ballistic computer program using 9.10 gr/cm³ pellet density, the same as Hevi-Steel. If Hevi-X pellets are equal (and with tungsten alloy, they should be denser), expect good killing downrange energy out to 60 yards and beyond. See table (p. 28). Hunting spooky birds like snow geese can require ammo that will reach out and touch 'em. And before you go out with a fresh box of Hevi-X, let me share something with you about long-range shooting. Years ago, I was at the roll-out of a new shotshell. One of the tests was to shoot mallards that flew from a bluff to a pond below. Shooting stations were set up from 30 to 60 yards. As we progressed farther from the line of flight, someone remarked, "It sure is harder to hit a duck at this range than to kill it." Truer words were never spoken! A few years back I was hunting with Bobby Joe Stansel at his Hackberry Rod & Gun Club in far southwestern Louisiana. A large V of snows and blues came towards us very high. I was shooting a now-discontinued steel/tungsten shell with a pellet density of 12.0 gr/cm³, and Bobby said, "Let's try 'em." I put what I thought was a long lead on the first bird, shot, and the third bird in line dropped out dead. All to say, if you're going to have the great fun of hunting snows, practice long shots! A sporting clay range ought to give you what you need, but a buddy with an old-fashioned hand clay thrower can make your life miserable for an afternoon. Shooting instructor Gil Ash says, "We have a mental safe zone for lead, and getting out of it takes practice." The same lead on a 25-yard mallard in timber ain't what you'll need with a screaming mob of snows trying to get away. Just like any tool, we need to learn how to use it, but with ammo like Hevi-X we have the edge. Keep safe, take a kid hunting and enjoy!